Mum loved baking; it gave her immense pleasure and joy. Remembering Mum’s Walnut Banana Muffin, Didi tries her hand at it. It looks yummylicious! Treat yourself to an utterly sweet world! If you do not have powered sugar, powder it and then measure. Here you will need 1 cup. Sieve maida, baking powder, baking soda and salt thrice so that all are very well mixed. Use softened butter. Do not melt. 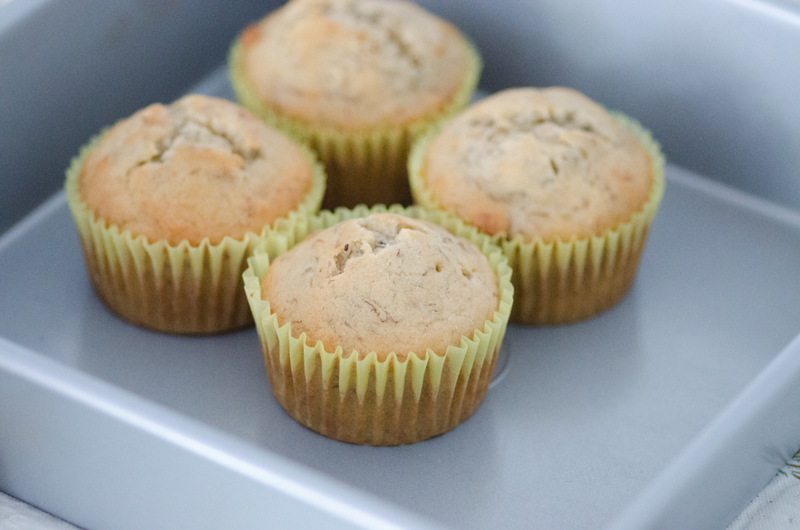 Line the muffin tray with paper cake cups. If you don’t have them, grease the tray with butter and dust with Maida so that the Muffins come off easily once baked. Preheat at 375 F or 190 C till it becomes hot. Mash the bananas and butter together without any lumps. Mash the bananas a little before adding the butter it becomes easier to mash. Beat the egg separately with vanilla essence. Do not overbeat. Stir in sugar, beaten egg and milk. Fold the dry ingredients into wet. Stop when they are just moistened otherwise the muffin will turn out to be hard. Slowly fold in the walnuts. Pour this mixture into the paper cake cups and bake at 375 F or 190 C for about 20 -25 minutes. Time may vary for each oven. Check if the muffin is baked with a tooth pick. The muffin is done if it comes out clean. Serve muffins for breakfast or have them with your evening tea. You can substitute walnuts for any nuts of your choice or make it just plain. This entry was posted in children, evening snack, kids favorite, Muffins and tagged banana muffin, cakes, muffins, walnut banana muffin, walnut muffin. Bookmark the permalink.